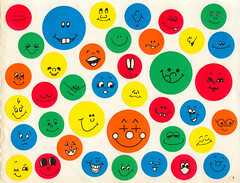 smiley face stickers courtesy of Flickr user "South Carolina's Northern Kingdom"
I enjoy searching for information – tracking down obscure citations and rejoicing over finding a related article in a different field. I love a search that goes from online resources to older print materials and back again. I was asked recently to work with a faculty member to do a literature review for a journal manuscript in science education, and I have been having a lot of fun tracking things down. I had a starting place – a list of preliminary sources and a rough draft of the paper – to guide my work, but it took off in many directions. So, what techniques have I pursued? Starting from the preliminary bibliography, I can examine the works cited sections of those papers to find additional relevant material. In addition, I can use Scopus to track citations forward in time. Exploring keywords in multiple databases. Like any search, there isn’t just one way to describe the topic we are searching. Using Google and other specialized search engines to explore the web. There is a lot of science education material on the web that has been posted by various educators. I was working with a topic I found interesting, in a field I am familiar with, with a faculty member who is nice to work with. It all adds up to job satisfaction. I decided to follow along with a librarian blog meme, the “library day in the life“. Since it is the summer, my day today is much different than a day during the semester. The most notable difference is the lack of meetings. Although the summer is a great time to make changes and get projects done, it can be very difficult to pull together all of the interested individuals. 7:55am – Arrive at work, Make tea. The day can officially start. 8:30am – Write up a blog post about our switch from SciFinder Client version to SciFinder Web. Checking to see if appropriate URLs have been added to our proxy server so folks can get to SciFinder off campus. 8:50am – Got distracted by Explored Barnes and Noble’s new eBook reader for iPhone. I already have the Kindle reader for iPhone, which I love. I’d like to encourage some competition in the eBook market, though, so I think my next few purchases will be from B&N. 9:00am – First reference shift of the day, substituting for an absent colleague. With very few students on campus, and even fewer in the library, this is very slow. One person asked for tape, but no reference questions. 10am – Another hour of reference for absent colleague. I will have three hours of reference today, one more than usual. Explore possible ways of fixing that link, which is being problemmatic. 11:00am – Make tea, get a snack. Finally figured out how to import our library blog to our library Facebook page. Did the same thing for my own blog on my own Facebook page. Also claimed the vanity URL for our library page. 12:15pm – Read an article about “making chat widgets work for online reference” from Online magazine (not freely available online). Passed it along to a colleague who is on the committee working to implement web chat here. 12:30pm – Lunch. Tried to read a Barnes and Noble eBook on my iPhone, but spent 15 minutes trying to “unlock” the book with my credit card number. Why can’t I just log in to my B&N account? Kindle reader wins this round. 1pm – Committee Meeting – “Creating a Collaborative Research Center”. I am on a campus committee here to look at ways to increase collaborative research (and the funding for that research). 2pm – Back on the reference desk, updating the Geology subject guide. Distracted by Explored the neat search options on Mindat.org. Finished adding some excellent resources. Emailed faculty to inform them of the changes and to ask for additional suggestions. 3pm – Finally answered a real reference question just as my reference shift was ending. Student was looking to see if we had any of the movies she had to watch for an assignment (most were checked out, but one was still available). 3:30pm – Head home. I’m leaving early on Monday and Tuesday of this week to spend some time with my family. This helps balance out all the times during the semester where I will stay late. Weeding a library collection is never a popular topic on college campuses. Libraries are sometimes quite open about their weeding policies, and sometimes they just hope no one notices. Faculty sometimes protest and libraries sometimes have to defend their decisions. Just the other day, I came across a perfect example of why we need to weed our collections: In the reference collection our library had a copy of a spiral bound users guide to Beilstein, the source of a wide variety of organic chemistry information. From 1966. First, the guide is to the print version of Beilstein, which doesn’t exist anymore (as far as I can tell). Second, we don’t have access to the electronic version of Beilstein. While this guide might be useful to historians of chemical information services one day, as an undergraduate institution with a constant need for more space in the library, we simply cannot justify hanging onto it. This year, the librarians at my library worked together to assess the library instruction portion of our freshman writing course. All freshman take this writing and critical thinking class, and faculty are required to bring their students in for one 1-hour session on library skills. Most faculty fulfill this requirement. Last summer, we spent some time revising the goals and objectives for this one 50 minute session. Based on the ACRL information literacy standards, our goals are rather modest: it is difficult to learn very much in 50 minutes. After revising our goals and objectives, we developed a brief test to assess this objectives. We were able to test some of our incoming freshman during the first few weeks of their college career. We also have the results of the test from students at the end of their first semester, and for other students at the end of their first year. The results are in, and I have spent some time analyzing them. After sharing the results with the librarians, we will meet again to decide if we need to revise our original goals and objectives. To me, this is the most important part of the assessment process. Good assessment requires you to go back and look at your original goals. Have you met your goals? If so, do they need to change? If not, what can you do to acheive those goals. Simply collecting data without re-examining the original goals is a waste of everyones time. So have the students met our goals? Well, mostly. 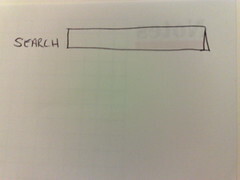 Worryingly (since I’m the library webmaster), students can’t seem to find our resources by subject lists at the beginning of the year or at the end. I have been on maternity leave for the past 2 1/2 months, and I am starting to get back into the swing of things. So, what do I tackle first upon my return? The easy things: possible style sheet changes for our website to change the look of our links. Sometimes the best way to get started again is to do a few easy things before hitting the larger projects. Oh, and I spent some time finding more science librarians to follow on Twitter, and editing my LinkedIn profile. That counts as work, right?